This spring, the timeless paisley motifs of trainmen bandanas have found their way out of back pockets (and more recently breast pockets). Not unlike the recent surge of camo, the pattern has worked its way into a slew of styles, from patchwork shorts and pocket T-shirts, to eccentric button-downs, scarves and even some canvas slip-ons. 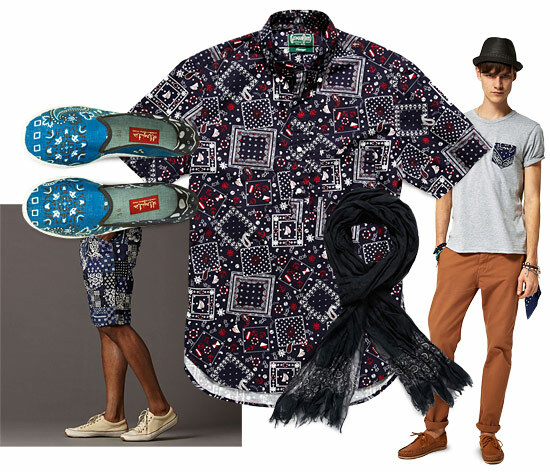 Bold prints are definitely big right now, and this familar style is likely the easiest to incorporate into your everyday kit. The first bandanas originated in India—the name comes from the Hindi word meaning "to tie."